Social work is a profession dedicated to helping people function as well as they can in their environment. Social workers see the overall picture—the impact of health care, psychological wellness, and physical ability—to suggest the best services to help your parent live as independently and happily as possible. Social workers serve in different settings and as in other professions, many specialize in particular areas of care, such as geriatrics, psychological counseling or home care. As you arrange for your parent’s care, seek out these professionals to give you a hand. • Can coordinate your parent’s move from one place to another, e.g. hospital to nursing home, hospital to home. Whenever you contemplate a change for your parent, whether it be a change in health care, living facility or personal care services, talk with a social worker, explain the situation and ask what services are available. They can draw on many resources and point you in the right direction. National Association of Social Workers. 750 First Street, NE, Suite 700, Washington, DC, 20002-4241. Website accessed on 3/5/2008. The Merck Manual of Geriatrics. Chapter 9: Geriatric Social Work. Accessed 3/5/2008. Because Don lived so far away, he felt uneasy that he couldn't often visit his dad at the nursing home to judge how things were going. He felt overwhelmed by the doctor’s reports, financial affairs, and care issues he faced. He heard about geriatric case workers from a friend and thought that he might need an objective observer to visit the nursing home regularly, check on the care given his dad, and let him know how his dad was doing. Then the hospital bills, including Medicare claims, started arriving at a fast clip. What to pay, what not to pay, how long to wait--Don realized that he would need help. The Geriatric Care Manager (or geriatric case worker) can be a nurse, psychologist or social worker, who can perform a variety of functions. If your parent is still living at home, the care manager can locally coordinate all the in-home care and services that your parent might need. A care manager can also visit the nursing home or other facility regularly while your parent is a resident, check on the care and report to you. The manager will regularly reassess the situation and suggest options for future care. • If your parent is living in a nursing center or other facility, work with the staff on site before bringing an "outsider" in. The LTC staff may view the care manager's arrival with distaste and your relationship and that of your parent's could be damaged. However, if you feel strongly that there is something wrong with the care your parent is receiving and discussions with the staff have brought no changes, then a care manager is an objective observer who can set the record straight and help you make a decision how to proceed. • The services of a care manager may be available free or low cost from your local Agency on Aging office or hospital. • Is your parent still living at home and does she need many in-home services which you are having difficulty arranging long distance? Would a coordinator be of help? • Is something seriously wrong with your parent's care at the nursing home and has the staff been unresponsive? Would an objective observer help you decide your next move? • Are you unsure just what your parent might need? Would an objective opinion help both your and your parent decide what comes next? If you answered “Yes” to any of these, consider hiring a geriatric care manager. • Use the federal government’s Eldercare Locator 1-800-677-1116. 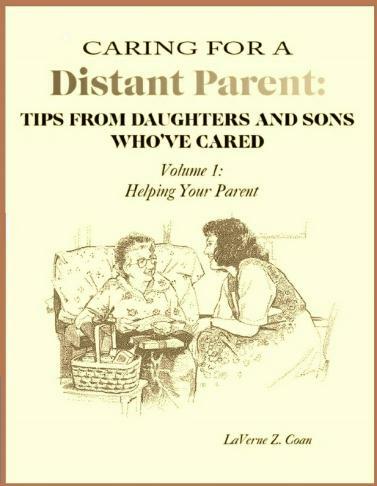 Text excerpted from Caring for a Distant Parent, Care Tips # 32 and #34.